The images have arrived. Credit goes to NASA/JHUAPL/SWRI. Follow those links if you’re curious about all the acronyms. Obviously, this was a team project. If you haven’t seen New Horizons Reaches Pluto – Part 1, you might want to read that post first to see how far we’ve come. Data and images will continue streaming in over the next couple weeks, as they need to be transmitted at a mere 2 kbs to reliably traverse the 7.5 billion km (4.7 billion miles) distance back to Earth. There’s dozens of images posted on the New Horizons page at NASA, if you want to see more. I’ve selected four of special interest. Above is Pluto, showing the intriguing “heart shaped” feature, now named Tombaugh Regio in honor of Pluto’s discoverer Clyde Tombaugh. This image was taken from a distance of 768,000 km (476,000 miles), 16 hours before closest approach on July 14. Pluto’s diameter is now known to be 2370 km (1473 miles), and its density 2.03 g/cm3 (compared to rocky Earth’s 5.51 g/cm3). This confirms the long-held theory that Pluto consists largely of ices (water, carbon dioxide, methane, ammonia, and nitrogen). The temperature ranges from -233 to -223 °C (-387 to -369 °F). For comparison, the coldest temperature measured on Earth is a balmy -88 °C (-126 °F). 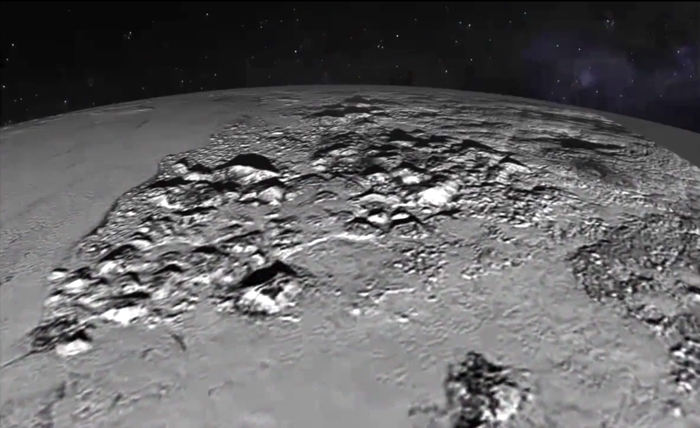 This view is from 77,000 km (48,000 miles) above Pluto’s ice mountains. Features as small as 1 km (0.5 mile) across are visible. It’s a composite image, with the background stars and nebula added for effect. The ice mountains are now named Norgay Montes (Norgay Mountains) in honor of Tenzing Norgay, one of the first two humans to reach the summit of Mount Everest. We know the mountains are made of ice (or covered by a thick layer) from the spectroscopic data. What caused their formation is unknown, since tectonic activity was not expected on such a small body. New Horizons passed within 27,000 km (17,000 mi) of Charon (pronounced “share-ON”), the largest of Pluto’s 5 moons. This image shows Charon with two interesting features. The large dark area, not yet named, appears to be an impact basin, but it lacks the usual well-defined rim. The other feature is the huge cliff at the 2 o’clock position. This cliff is seen edge-on, and shows a wall rising 10 km (6 miles) above the surrounding topography. It could be an impact crater, but the surrounding “moat” is puzzling. There’s a similar, but much smaller, feature near 4 o’clock. Charon has more craters per square kilometer than Pluto, but still surprisingly few. Again, tectonic activity is not expected. It’s diameter is 1270 km (790 miles). 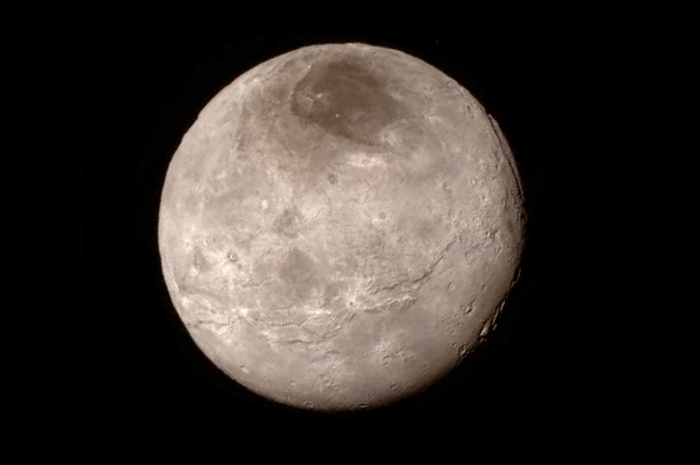 That makes the Charon/Pluto diameter ratio 0.54 — the largest of any moon/planet system known. 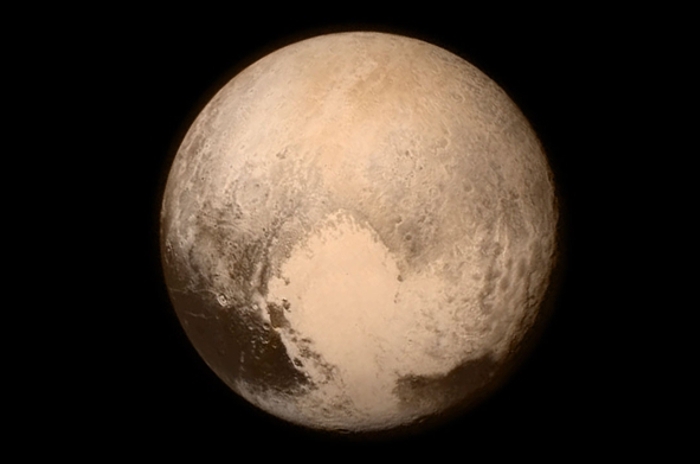 It’s density has now been measured at 1.83 g/cm3, slightly less than that of Pluto. This composite image shows the approximate relative reflectivity, size, color, separation, and orientation of Pluto and Charon in their mutual orbit. I say “mutual” since their masses are close enough to set the barycenter in empty space. 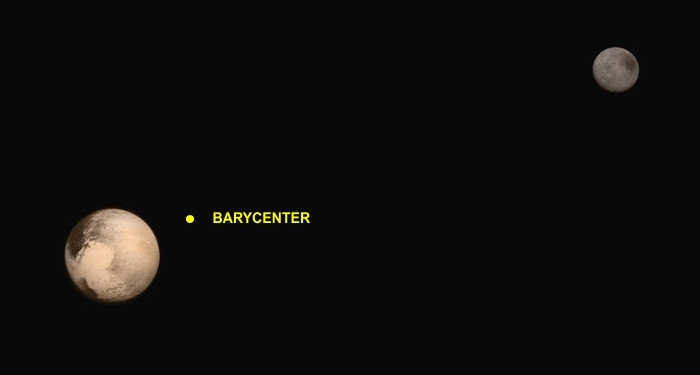 The barycenter (yellow dot in image) is the place where the two objects would balance if placed at the ends of a rigid massless rod and allowed to “settle.” This is also the point around which both objects mutually revolve. There’s a nice animation showing this dance on Wikipedia. This type of orbit is also unique in our Solar System. The closest other pair is the Earth and Moon. But in our case, the barycenter is about 1650 km (1000 miles) beneath the Earth’s surface. This raises the interesting question of whether Pluto and its moon Charon should be renamed the Pluto-Charon binary dwarf planet (or “double dwarf planet”). We already use that terminology for pairs of orbiting stars and asteroids. I’d vote for “binary dwarf planet,” but it’ll be up to the IAU to decide, as they did when demoting Pluto from “planet” status back in 2006. I should also note that we confirmed Pluto and Charon are mutually tidally locked. That means both bodies present the same face to the other continuously, as the Moon does for Earth. This is a gravitational effect that takes some amount of time to stabilize — it’s unlikely the two bodies formed in this configuration. And that’s why the resurfacing of Pluto and Charon is difficult to explain, since there would be none of the tidal flexure that keeps Io and Enceladus volcanically active. There could well be a Part 3 to this series. Interesting questions have been raised, more images and data are yet to come, and the planetary scientists and geologists are working 24/7 to make sense of it all. So we’ll give them a few weeks before revisiting this exciting mission to see what they’ve learned. That will surely include more questions. In the meantime, while New Horizons is sending its data, it’s heading outward at the record-breaking speed of 16.26 km/s (58,536 km/h or 36,373 mph) into the Kuiper Belt and beyond. Mission planners are now considering a visit to yet another Kuiper Belt Object (KBO) in 2018-19. Three targets are being evaluated. All are much smaller bodies, less than 100 km in diameter, but offer more to be learned. New Horizons is running on nuclear power, and has a design lifetime of 20-25 years. That’s 9 years down and 11-14 years more to explore.